If you haven’t heard of Openreach you won’t be alone. Openreach is the company that owns, operates and maintains the UK’s phone and broadband line network. Openreach is a huge division of BT, or British Telecommunications PLC, now known as BT Group. BT Openreach was established in 2006, owns the telecommunications pipework and phone cables in the UK, and employs 32,000 people. Essentially Openreach owns the entire UK phone and broadband network – and those 32,000 employees are very busy, making around 9.5 million visits to homes and businesses a year; 25,000 per day. The rest of BT, like other phone providers such as Mainstream Digital, are essentially ‘customers’ that have equal access to the Openreach network. Virgin Media isn’t included because it does not use the copper network – it has its own cable network. Openreach manages the UK’s local access network – this is what connects your house, the place you work and the shop down the road to the local telephone exchange and everything in between. The green cabinets you see in the street that handle broadband or phone lines? Openreach owns those. Openreach also manages the connection between the phone lines and the other providers that connect up in the exchange. So why does Openreach exist? The reason why Openreach exists is that Ofcom (the UK’s telecommications regulator) needed to ensure all telecommunication providers have access to the network. The problem was that the network was owned by one major company – BT – that, naturally, was the market leader. As other companies were – quite reasonably – keen to get in on the act during the early days of ADSL broadband, the need arose for the network to be somehow separated from BT’s phone services division. 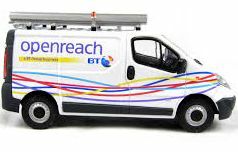 After Ofcom’s 2005 Telecommunications Strategic Review (TSR), the solution was the establishment of Openreach, even though it remained under full ownership of BT. Over 500 different companies now sell services that run via the Openreach network. Fast forward to today and Openreach is undergoing change – BT Group agreed in March 2017 that it would spin Openreach off as a legally separate company. This was, once again, in response to a demand from Ofcom. This is happening because the arrangement – where Openreach was owned by BT Group – wasn’t working wholly well. There have been some successes, not least the post-2010 rollout of an £800 million fibre network that has revolutionised non-cable internet connection speeds in the UK. However, Openreach has come under criticism in Parliament and elsewhere. Rollout of fibre has been slower than was originally promised, while network investment has not been to the level it should have been, notably in rural areas – where network speeds continue to lag behind Ofcom’s minimum target of 10Mbps. This still affects over three million customers in the UK. Customer complaints via service providers have been high (we personally know several people have have had bad experiences when moving provider or getting new lines installed or repaired because of delays from Openreach). Customers can’t contact Openreach directly, because they have to go through their service provider. Ofcom also fined BT £42 million in early 2017 for regulatory breaches over compensation payments to other telecoms providers for work that was completed late.